A digital board will be easier for travelers to follow and won’t have to be fixed as often. UPDATE: The iconic board may be saved… sort of. Details here. Wait for a train at 30th Street Station, and soon enough you’ll hear the clicky sound. It comes from the departures board, the numbers and letters flipping over as trains leave and times and tracks change. But pretty soon that sign, and its sounds, will be phased out. Amtrak confirmed to Billy Penn the classic board that’s stood in the middle of 30th Street Station for some three decades will be replaced in favor of a digital board. The new digital board is still in the design phase and there’s no timetable yet for when the old one board will be removed. The old sign is called a Solari board, named for its Italian manufacturer. And the change away from it is all about simplicity. Amtrak wants to make life easier for travelers and for themselves: When the Solari board needs to be repaired, it gets complicated. Amtrak management isn’t quite sure how long the departures board has been in 30th Street Station, but Chris Jagodzinski, Amtrak’s chief of operations, told Billy Penn last fall it had probably been there since the 1970s or 1980s. As cool as the Solari board looks and sounds, it hasn’t been easy to maintain. A station employee said one side of the board was recently broken, with the letters and numbers basically turning up as gibberish, and it took several months for replacement parts to be found. It also runs on software nearly as old as the board itself. The board operator works in a small office located inside the customer service center at 30th Street and use four desktop computers that run on Windows 95. Some of the computers are used for tracking trains as they enter and leave the station. One is used for manually entering track and time changes. Philadelphia is one of only a handful of major East Coast cities believed to still have one in use. Others included New York’s Penn Station, Newark’s Penn Station, New Haven’s Union Station and Providence Station. 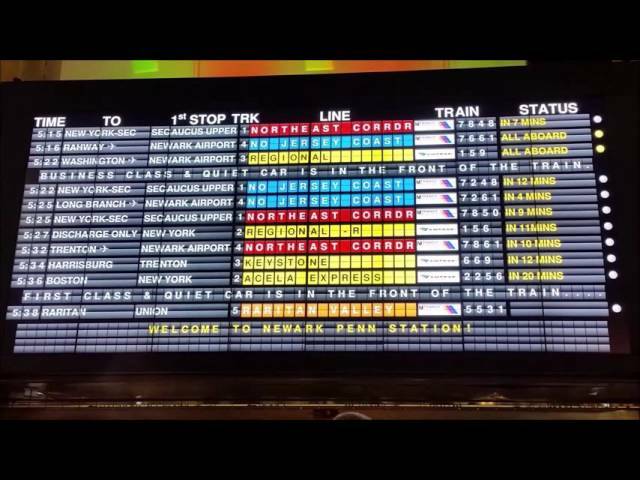 New Haven got a digital board in 2014, Newark got one in 2015 and New York Penn Station’s Solari board was replaced this week. Providence still had an old-fashioned board earlier this summer, but word is the station is installing a digital board. Philadelphia could be the last big East Coast city to have one. And it won’t be around for much longer.